Despite using Smackdown talent on the show, Main Event still shows Monday Night RAW highlights, just in case you were still undecided on which show is still the flagship programme of WWE. This week among the same clips shown on Superstars, Smackdown Tag Team Champions Rhyno & Heath Slater had a bout against The Ascension (Konnor & Viktor) in the headline. But was it any good? Heath Slater and Rhyno going over The Ascension was a pretty good tag team contest that was easy to watch and made the most of the four talents better attributes. This was the best I've seen Konnor and Viktor look in a long time, as they showed a real viciousness in their offence and Konnor in particular took the opportunity by the horns in an entertaining strike battle with Rhyno in the early goings. The crowd was really into this, spiking during Slater and Rhyno's initial face shine, but also remaining hot throughout Slater's run as the face in peril. Slater did a great job in this role, as he remained entertaining as he would reach for the wrong corner for the tag, as well as garnering some decent sympathy. 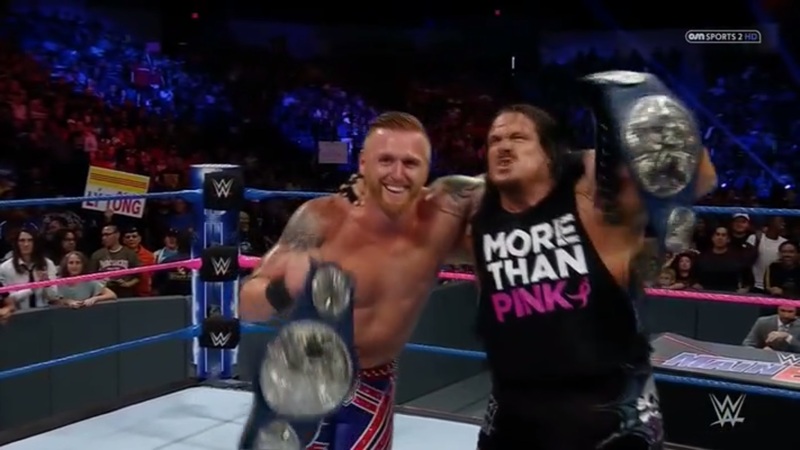 The finish was done well and a change from the way most Slater and Rhyno bouts have gone, including a sweet breakdown segment that saw Viktor hit a sweet corkscrew forearm on Slater and Rhyno nailing a Gore for the win. Like Main Event has been for a while, this match was completely throwaway, but still an entertaining watch between two teams who have worked incredibly hard since the brand split. Naomi went over Natalya in a match that started strong, but became very sloppy heading into the finish. Show in a Sentence - Ten minutes worth watching if you'd already seen RAW, but the tag team match was a good watch.